i just got a new fibaro motion sensor (FIBEFGMS-001-ZW5). The Firmware of my sensor is v3.5. I added it to my devices and want the sensor to turn lights on and off. Basically i want to turn on lights when someone enters a room and turn off the lights when the person leaves. 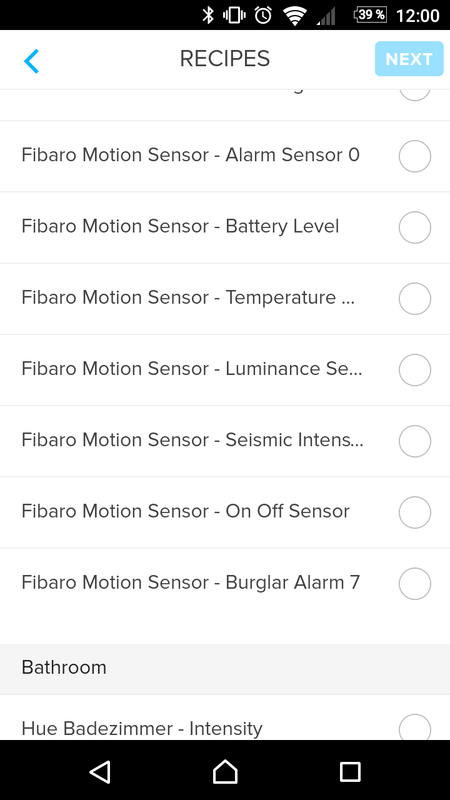 When motion or vibration is detected, the event history shows "Fibaro Motion Sensor: Burglar Alarm went off!". (like stated in an earlier post). I can use this event to turn on lights/ start a recipe. But: After an "alarm cancellation delay" of 30 sec (Parameter 6) the sensor should cancel the alarm when there is no movement. This event is not shown in the event history. Edit: the alarm cancellation is also displayed as "...: Burglar alarm went off!" in the event history, see next post. Therefore i can not use the sensor to turn off the light after the person has left the room. Furthermore i would like to know whether motion OR vibration is detected (and see this in the event history). I noticed somothing else thats buggy (and bugs me): The alarm cancellation timer (Parameter 6) is set to 30 seconds. This basically means if the sensor senses no motion for 30 seconds it send a notification about the alarm cancellation to the controller. It seems, that "all" reports of the motion sensor are summarized under "...: Burglar alarm went off!". This leads to the following buggy situation: If the light is turned on by the sensor, and i turn it off within those 30 seconds, the alarm cancellation report is interpreted as "...: Burglar alarm went off!" and the light goes back on. As Ingrid said, we apologize for the delayed response. I can assure you that we are working on a fix. Once I have a better idea as to when the fix will be implemented into a firmware release I will update you separately. it is now a week ago that Ii have described my problem with the motion sensor. Has anyone already taken care of that? Hi, Markus M. Thank you very much for reporting this and all detailed information so far. I'm sorry for the late response. I will forward it to the team and come back to you as soon as possible. Do you think i can use the sensor soon? Markus M Thank you very much for coming back to us. The team has contacted the manufacturer, and they are now waiting for a response. I'm afraid that we still can't set a timeframe yet. Have a nice weekend! 🙂Stay tuned! Ingrid Was this part of the recent firmware 0.51.13 update? I still can not get the sensor to work. I'm waiting patiently and hope for a speedy solution. Today, I've tried to reset my Z-Wave controller to re-add all my Z-Wave devices and set up the Z-Wave devices again from the beginning. Unfortunatelly the motion sensor remains in the device list and is listed in the "living room". When i try to change the room of this device comes a message: "There was something fishy going on: "n is undefined"". When i try to use the device exclusion, the device remains in the list. Also the sensor is shown under "offline devices - plugged in?". Open the context sensitive menu of your device and select Delete. This will start the exclusion process. If you are unable to exclude the device, use Force Delete to remove the device. Your device should be removed this time. You should do another reset z-wave controller. I would not be surprised if your device reappears. In that case, you are having a Phoenix device. The "Phoenix device" is exactly what I am experiencing. What does that mean? Is this a know problem? It means that you will not be able to get rid of the device and will have to do a factory reset the device. I consider this a problem. Will the phoenix device affect the the functionality when i re-add the sensor? I think Patrick and Michael Kohler are in a better position to answer that. can you please clarify the situation. I'm waiting for about a month now. Please make the sensor work soon™. Markus M No, if you correctly factory-reset the Motion Sensor (if not fully excluded yet) and add it again, I would not expect any negative effect from the "phoenix device". So the "phoenix device" is a bug neeo is suffering from? Will this be fixed with a future update? Are you making progress with integrating this sensor so that it can be fully utilized? yes, the "phoenix device" is a bug NEEO is suffering from. We are investigating this, but it turns out that this can't reliably be reproduced up to now. If the light is turned on by the sensor, and i turn it off within those 30 seconds, the alarm cancellation report is interpreted as "...: Burglar alarm went off!" and the light goes back on. This will be fixed in an upcoming release (0.52.x). Is there anything else blocking you from using this device? At the moment I can not start any actions based on the values of this sensor. But I think this is a general problem Neeo currently has - Starting actions based on sensor values. The sensor values currently (0.51.13) do not appear in the "NEEO Event history". In 0.50.6 they appeared as "...: Burglar alarm went off!". The NEEO event history would get very long if all sensor events would be in the history and would require some kind of filtering option. I recommend to limit the history specifically to events related to the Brain and an event list for a specific device accessible from the context menu of the device. Why is it not possible to start recipes based on the values of this sensor? Is this a general problem or do i really need to factory reset my brain? Markus M Can you please attach a screenshot of all the sensors that you can choose from this device when creating a recipe? Which one of those did you try? Are all of them not working or just one? If so, which one? these are the sensors I fan choose from. I can not start a recipe with any of them. As I understand the burglar alarm should be the actual motion alarm. Actually I have also tried to create recipes based on different sensor values. For example the power status or dimmer level of a Hue bulb. Those didn't work either. I found the following in the release notes of the latest update (0.53.8). Unfortunatelly i still can not get my z-wave motion sensor to work?!? Do i have a broken sensor or a broken brain? BTW: recipes based on the status of philips hue lamps do work now. I do not get a z-wave based recipe to work!? Markus M Hello. Have you tried to reboot your NEEO Brain? What if you exclude that device and then include it once more? Jeff Hi, i have already tried both. Jeff do you have any other ideas? Markus M You can try to perform a full reset of the z-wave controller or the NEEO Brain to see if that helps. I will pull in Michael Kohler to see if he has any other ideas. Jeff I just performed the reset of the z-wave controller (again). The sensor still remains/ apears in the device list as he used to before (see above). Didn't you fix the "pheonix device" in the latest update? After readding the sensor i still can not get it to work?! Jeff I just went all in and did the factory reset on my brain. For testing i just added the sensor and the TV to see whether i can toggle the power with the sensor. Now my entire setup is gone and the sensor still does not work. Jeff btw: is Michael Kohler still around? his last post is one month old. Markus Has this device ever worked as intended? I am not familiar with Z-wave devices. How does the device work that you own without NEEO as the controller? Hi Jeff the device never worked. I have no other z-wave controller to test the device with. On the other hand i have a Fibaro Dimmer 2 and i was not able to create a working recipe with those sensor values either. Hi Jeff , so i have tested the replacement Sensor. It does not work with this either. So the only thing left is, that something is wrong with the brain. Either the software or the hardware. Can you replace the brain or suggest a different solution? Has this device ever worked as intended? When i first started this request, i was able to start a recipe with this sensor (kind of): When the motion alert was triggered, the event history was displaying "Burglar alarm went of" and the recipe was started. After the alert is over the sensor sends a alarm cancellation to the controller. Because this cancellation was also interpreted as "Burglar alarm went of", the same recipe was then started a second time. So due to this misinterpretation i was not able to use the sensor back then. Later the firmware 0.51.13 was published, which did not fix my problem. Instead the event history was not displaying the "Burglar alarm" from this Version on. And from that point on I could no longer use the sensor to start any recipe. Then Michael Kohler told me this would be fixed in 0.52.x. Now we have 0.53.8 and i still have the problem. Markus M We can try replacing your NEEO Brain. Can you please email support@neeo.com? Jeff Done. Please check your inbox. Jeff I finally had some time to test the replacement brain. It behaves just like my old one: It does not start any recipes based on the values of my fibaro motion sensor. Markus M Nothing else to do. I'm pretty sure I mentioned to you that a replacement brain may not even help. Jeff So how do I get my sensor to work now? Are there any z-wave sensors that work? The problem is not directly related to the fibaro motion sensors. None of the motion sensors I installed can trigger any event. Clearly a generat NEEO problem. However, as NEEO abandoned Z-Wave, there will be no solution to this problem. Christian Hi Christian, sorry to see you feel we have abandoned Z-wave. I can assure you this is not the case. Michael Kohler is actually one of our Z-wave devs. He is pretty active on here, and he's trying hard to fix all the issues we're experiencing with Z-wave. I am VERY confident we will solve these issues as we progress :). I have not read such information anywhere. Is this an official statement of Neeo? No, that is Christian ‘s opinion. The only problem is that we don't see any progress. Winter is coming and the radiators are not working. Motion Sensors or any sensors at all are not working. Can you see the power consumption of any switch? Can you move the roller shutter half way down? Nothing really works, you can add the devices but you are not able to really use them as long as it is not as simple as an on/ off switch. And the only answer you get is that they are working on it (in many cases since ages) or they move the topic to the vote section. Christian Hi Christian. I completely understand you’re frustration. As a small company we’re trying to allocate our resources into features that will have a bigger impact on the community. I am more than confident Michael Kohler and team will get this sorted out :). I know it’s taking a lot longer than expected, but believe me that we’re working hard to make things happen. I sincerely appreciate your patience in this matter and you have my word that these wrinkles will get ironed out sooner rather than later. Jeff is the actual work on Zwave still as you mentioned some months ago or has everything been shut down regarding z-wave development after the well off? Is it possible to display the temperature coming from this sensor?